Finally, a comprehensive map of Manila’s Chinatown! I remember my first trip to Binondo (the one that I can remember anyway). It was late at night and we were driving around this strange new place, guided by friend’s boyfriend who live in the neighborhood. I have absolutely no idea where we are, except that we were in Chinatown. The second time I went to Chinatown was when I joined Ivan Man Dy’s Big Binondo Food Wok tour. He led us through Ongpin, Binondo’s main street, and down other smaller streets like Nueva and Salazar. He took us to the best places to dine in Chinatown, but I wasn’t really familiar enough with the place to remember where most of the places are. A couple more trips to Binondo helped. Without Ivan to guide us through, I explored Chinatown with friends and family, discovering new restaurants and getting a hang of the street’s orientation. Of course, the problem with getting familiar with one place, it gets hard to give directions to those who haven’t been there before. Well, not anymore. Ivan has recently come out with his Big Binondo Food Wok Map, a beautifully made guide through Manila’s Chinatown. It features Binondo’s interesting buildings, temples and of course, food places! I love how the streets are marked with big bold letters, attractions with cute illustrations and establishments with a star, a colored circle or a square so you can easily distinguish between different kinds of restaurants. The map is certainly not to scale, but it’s still a great companion when exploring Chinatown. Of course, this means that the cafe you’re looking for might be a lot farther than you think. The map is given free to joiners of Ivan Man Dy’s Big Binondo Food Wok tour or you can buy the map at Bahay Tsinoy Museum (Intramuros), La Monja Loca Store (Intramuros) and Silahis Arts and Crafts (Intramuros) in Manila, the Libros Filipinos Bookshop (Filipinas Heritage Library) in Makati and Popular Bookstore in Quezon City. Or you can get one for free here! Tell us what your favorite restaurant is in Binondo (and what you always order!) 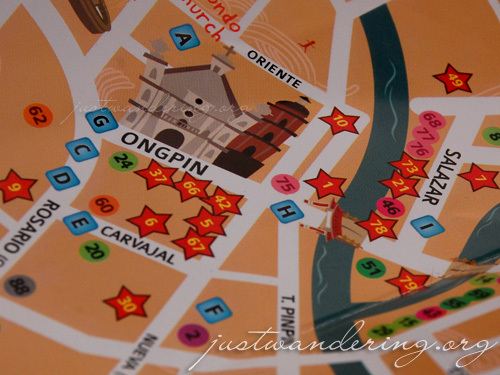 and you get a chance to win one of three Big Binondo Food Wok map! Contest runs from January 24 until January 31, 2010. Winners will be the top 3, as listed by Random.org and will be announced on February 1. Contestants can join the contest by posting a comment stating their favorite restaurant and favorite dish in that particular restaurant in Binondo. One comment is equivalent to one entry. Multiple comments from one user only counts as one entry. I know your IP, don’t try to cheat. Contest duration is from January 24 to 11:59pm, January 31, 2010. Names of contestants will be listed and randomized using Random.org. Numbers 1, 2 and 3 will be the winners. 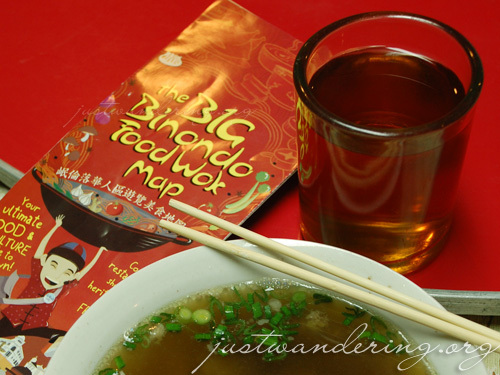 Winners will get one copy of Ivan Man Dy’s Big Binondo Food Wok Map. Not that I’m around a lot, but I love Dong Bei’s fried dumplings! NOM. It’s Ambos Mundos’ Callos for me. Heavenly! Big cartoon maps are very user friendly. It just somehow makes you feel more in touch with any unfamiliar location. Maxim Tea House’s awesome awesome hakaw. I love Sincerity Chicken Restaurant in Yuchengco Street. .. I always order of course the fried chicken and oyster omelette..
well, mine’s not a restaurant but they sure serve the best fried siopao. would that count? By the way, where can you find Ang Tunay Beefhouse? my fave is the best chinese lumpia in the country, New Po Heng’s lumpia! it’s makong ! For their noodles! I love the fried dumplings at Dong Bei. they are prepared right in front of your eyes, unlike of those in the fastfoods..